With a moderate price, easy use and a waterproof casing up to 60 meters (officially 40m), you’ll increasingly meet fellow divers carrying a GoPro to capture their scuba experience. Overall, the photos and videos from GoPro are pretty good, although usually not great. Here are 7 Basics that you need to know when you start diving with a GoPro. After getting my GoPro last year (see review) I have taken 1,000’s of photos and many videos during a few dozen dives, gaining practical experience on how to best use the GoPro underwater. I’ve learnt that if you stick to a few basics, the quality of your diving media can drastically improve. Go through the following 7 basic steps and see if you can increase your diving photography performance. Step 1: Buy a red filter! For snorkeling you’re fine, but anyone diving deeper than 5 meters needs to have a red filter (up to around 20 meters). Any cheap version will do, as long as it clicks on/comes-off easily of your GoPro and it should have a strap to your camera so that you won’t lose it. Without a red filter your pictures and videos become pale-blue, losing color and warmth, see the example below. 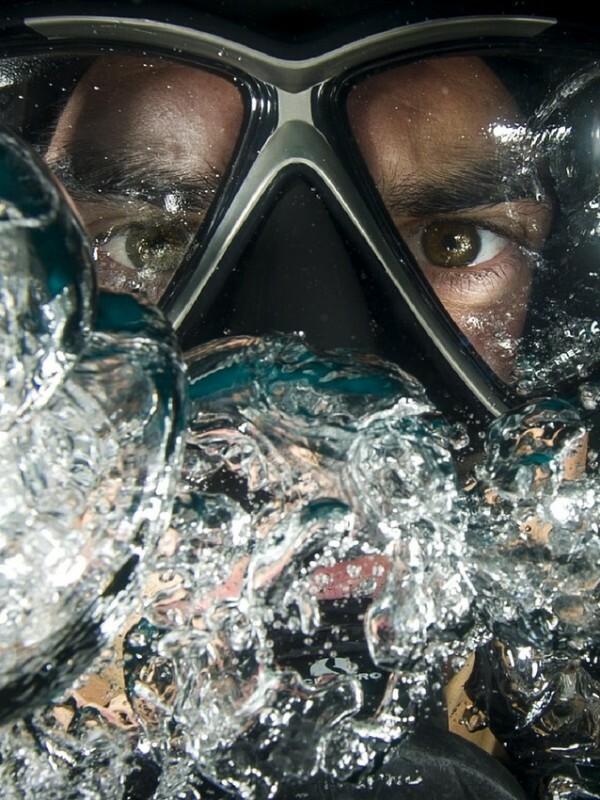 This is harder than it seems and depends on what you plan to do with your GoPro underwater. Many divers that I know use a stick (with a floating grip) and personally I use a wrist-strap. Both are ideal to see what you’re capturing and it’s also easy to change settings during a dive (or take a selfie). Being a bit ADHD-ish, I use my arms too much while diving, so most of my videos are a bit shaky. I tried a head strap/mount, but the downside is that you can’t see what the camera is doing (and I’m that type of guy who finds out after his dive that the camera wasn’t switched on). The best thing about a body/head mount is that you won’t be tempted to fool around with the camera during your dive, forgetting about your surroundings or your buddy. In such case, go for continuous video with the option of interval-pictures. Make sure your SD card has sufficient space (I use 64GB, class 10 speed). Whatever you choose: think ahead about the type of footage you’d like to get from your dives. On my first dives I changed the frame-rate ( fps) to a low setting with the idea that I needed more light under water. Although this might be true, I found that many pictures were blurred and unclear. After taking to several divers who just use the standard settings (60 fps), I decided to go with that as well. I still ditch 50% of my pictures (I take many), but that has other reasons (see below). If you have a great recommendation for camera settings for underwater, let me know. Until then I’ll stick to the standard. The angle (superview, wide, narrow) is a setting you could change if you like. The wider it goes the more you capture, but the distance to an object seems further away. I took a picture of a sea snake at very close range and when looking back it’s like a mile away! Often you won’t have time in between dives to charge your GoPro, so bringing an extra battery is highly recommended. If you plan 2 dives, switch the battery for your second dive, regardless how much power you still got left. I’ve experienced several times that my battery went dead halfway my second dive, only minutes away from a picturesque moment. Step 5: Keep your old camera! During my last dive I promised myself to dig up my ‘traditional’ digital camera (a Lumix). Yes, it’s dated, but close-ups/macro shots –even without flash– is pretty good. Just know that GoPro is TERRIBLE at close-ups: it can’t zoom and the smaller stuff is hard to capture due to the wide-angle. You start realizing after a while that it’s a great action-camera to capture moments, not macro-life. So if you’re lucky to spot a pygmee seahorse, grab your old fashioned camera and forget about the GoPro. Step 6: Enjoy your dive! The course director at my last liveaboard trip told me at a certain night dive: “don’t bring your camera, just enjoy the experience”. It sounds trivial, but sometimes you’re too preoccupied with your camera and miss out on some amazing stuff around you! Enjoy what you see first, and then capture it with your camera. Editing your media with media management software makes a huge difference. The GoPro Studio has several features to improve the quality of your media. Personally I use Picasa for enhancing my photos before using the GoPro studio. Many other tools are just as fine. What I like about Picasa is that I can automatically auto-correct contrast for a batch of photos. For videos it might be noteworthy that you can auto-stabilize them with the YouTube Video Editor. Enjoy your diving and leave any comment if you like.